To celebrate and raise awareness of International Women’s Day, Barnsley College’s Enterprise department created a day of talks with inspirational women speakers – including Rugby World Cup winner Maggie Alphonsi. Over 400 students from across the College and Sixth Form attended. Each speaker had an individual interpretation of success and taught the students how to change their way of thinking to enable them to succeed. The event’s aim was to inspire the students to ‘press for progress’, International Women’s Day’s message this year. The first speaker Helen Jaggar, Berneslai Homes CEO, discussed her upbringing and education and talked about the work that Berneslai Homes does. She went on to detail why people may need to use the housing association and the barriers they face. Speaker Sammy Woodhouse spoke of her extraordinary battle as a Child Sexual Exploitation (CSE) survivor and discussed the possibility of thriving through dark times in life. 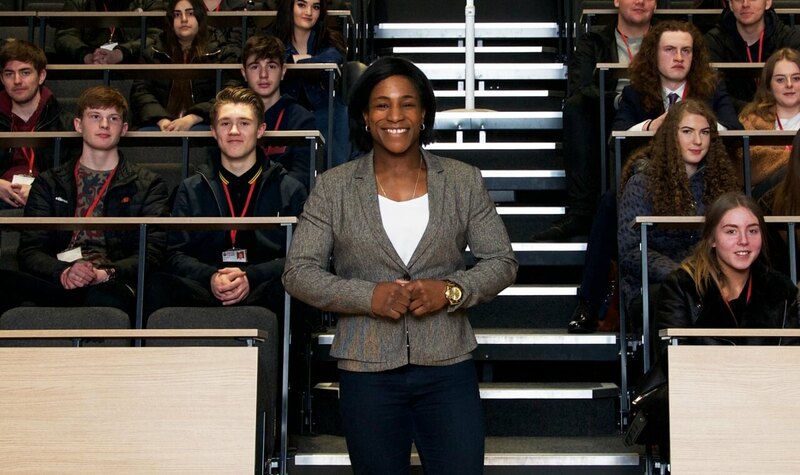 Rugby star Maggie Alphonsi inspired the students to push for their goals, giving them her top tips for success and creating a winning mind-set. Author Hope Virgo explained her struggles with mental illness, motivating the students to talk about these sensitive subjects and to know that recovery is possible. Diana Terris, Barnsley Metropolitan Borough Council Chief Executive, encouraged the students to celebrate how far equality has come, but to also keep striving for progress. She used her own experiences working in a male dominated industry to emphasise these issues.